Here are some snazzy birthday facts about 27th of July 1986 that no one tells you about. Don’t wait a minute longer and jump in using the content links below. Average read time of 10 minutes. Enjoy! What day was my birthday Jul 27, 1986? July 27, 1986 was a Sunday and it was the 208th day of the year 1986. It was the 30th Sunday of that year. The next time you can reuse your old 1986 calendar will be in 2025. Both calendars will be exactly the same! This is assuming you are not interested in the dates for Easter and other irregular holidays that are based on a lunisolar calendar. There are 99 days left before your next birthday. You will be 33 years old when that day comes. There have been 11,954 days from the day you were born up to today. If you’ve been sleeping 8 hours daily since birth, then you have slept a total of 3,985 days or 10.91 years. You spent 33% of your life sleeping. Since night and day always follow each other, there were precisely 404 full moons after you were born up to this day. How many of them did you see? The next full moon that you can see will be on April 19 at 11:14:00 GMT – Friday. Fun stat: Your first one billion seconds (1,000,000,000) happened sometime on April 4, 2018. If a dog named Dyce - a Akita breed, was born on the same date as you then it will be 188 dog years old today. A dog’s first human year is equal to 15 dog years. Dogs age differently depending on breed and size. When you reach the age of 6 Dyce will be 45 dog years old. From that point forward a large-sized dog like Dyce will age 5-6 dog years for every human year. The Jamaat al Muslimeen attempt a coup d'état in Trinidad and Tobago, occupying the Trinidad and the studios of Trinidad and Tobago Television, holding Prime Minister A. N. R. Robinson and most of his Cabinet as well as the staff at the television station hostage for six days. STS-114: NASA grounds the Space Shuttle, pending an investigation of the continuing problem with the shedding of foam insulation from the external fuel tank. During ascent, the external tank of the Space Shuttle Discovery sheds a piece of foam slightly smaller than the piece that caused the Space Shuttle Columbia disaster; this foam does not strike the spacecraft. What does my birthday July 27, 1986 mean? 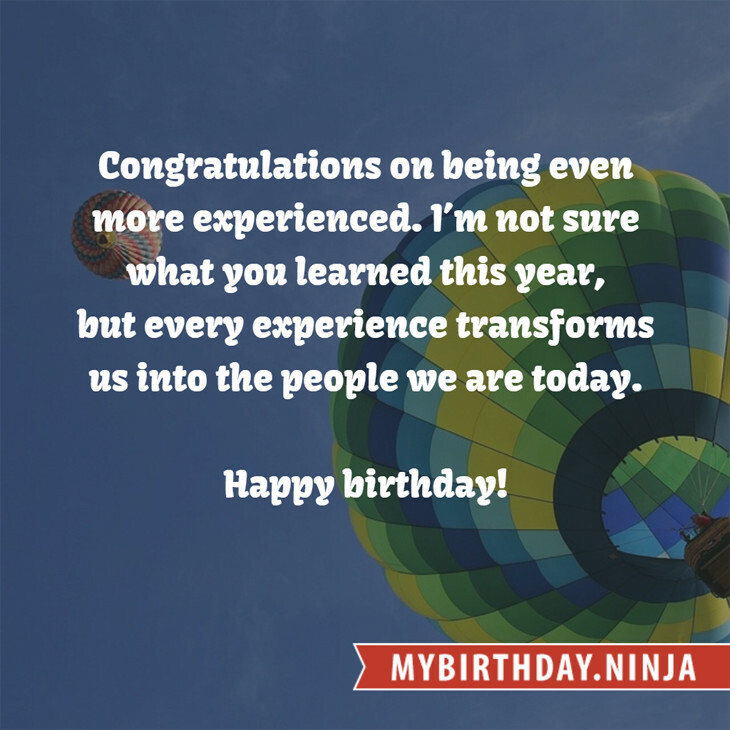 Your birthday numbers 7, 27, and 1986 reveal that your Life Path number is 22. It is a master number that represents practical idealism and material mastery. You were born under the most powerful and potentially the most successful of all Life Path numbers. The following celebrities also have the same life path number: Sarah Chalke, Willie Nelson, Malin Reitan, Sam Waterston, Lewis Fitz-Gerald, Hank Wangford, Nicola Moscona, Milagros Schmoll, Helen McCrory, Chris Curtis. 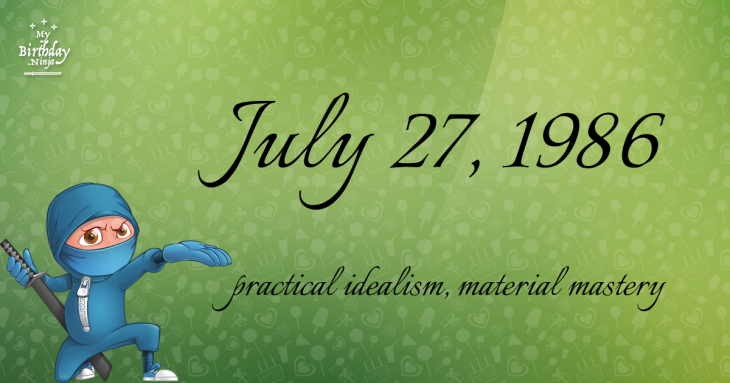 What is the birthday horoscope for Jul 27, 1986? The Western zodiac or sun sign of a person born on July 27 is Leo ♌ (The Lion) – a fixed sign with Fire as Western element. The ruling planet is Sun – the center of our universe. According to the ancient art of Chinese astrology (or Eastern zodiac), Tiger is the mythical animal and Fire is the Eastern element of a person born on July 27, 1986. Fun fact: The birth flower for 27th July 1986 is Larkspur for haughtiness. The number-one hit song in the U.S. at the day of your birth was Glory of Love by Peter Cetera as compiled by Billboard Hot 100 (August 2, 1986). Ask your parents if they know this popular song. How many babies were born on July 27, 1986? Base on the data published by the United Nations Population Division, an estimated 137,616,130 babies were born throughout the world in the year 1986. The estimated number of babies born on 27th July 1986 is 377,030. That’s equivalent to 262 babies every minute. Try to imagine if all of them are crying at the same time. What is the popular baby name on 27 Jul 1986? Here’s a quick list of all the fun birthday facts about July 27, 1986. Celebrities, famous birthdays, historical events, and past life were excluded. Try another birth date of someone you know or try the birthday of these celebrities: March 30, 1955 – Randy VanWarmer, American singer-songwriter and guitarist (d. 2004); July 10, 1986 – Simenona Martinez, American actress; September 14, 1941 – Bruce Hyde, American actor and academic (d. 2015).